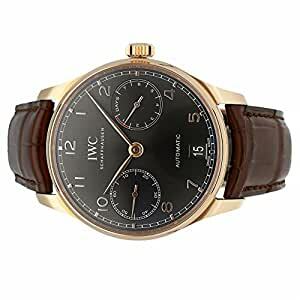 Pre-Owned IWC Portugieser (IW500702) self-winding automatic watch, features a 42.3mm 18k rose gold case surrounding an ardoise dial on a brown crocodile strap with an 18k rose gold deployant buckle. Functions include hours, minutes, small-seconds, date and power reserve indicator.Â This watch comes complete with box and papers. Majority of time remaining on the factory warranty!